Reporters waited in the lobby of Trump Tower on Tuesday for vague remarks from President Trump about infrastructure. White House aides tamped down expectations ahead of time: they said the president was not expected to take questions. 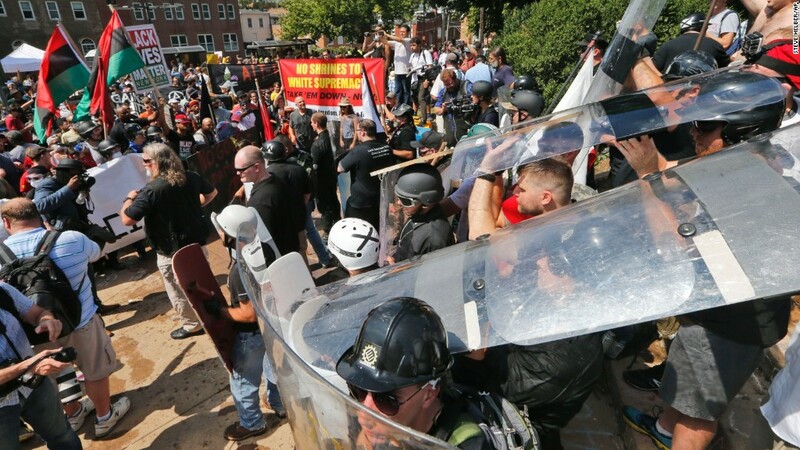 Trump said "both sides" were responsible for the violence in Charlottesville that left three people dead on Saturday, seemingly equating neo-Nazis with anti-racism activists. After the Q&A session, members of the media freely expressed shock, disappointment and sometimes outright disgust. "Wow," CNN's Jake Tapper said immediately afterward. "That was something else." "What I just saw gave me the wrong kind of chills," Chuck Todd said on MSNBC. "Honestly I'm a bit shaken by what I just heard, and I suspect it's not just me." An editorial in Wednesday's Washington Post was titled "The nation can only weep." MSNBC's Nicolle Wallace wondered if some of Trump's aides would resign. Others wondered aloud about the president's fitness for office. Some hosts and commentators on Fox News were also sharply critical of the president. "I'm wondering if it's actually real life what I just watched," 5 p.m. co-host Kat Timpf said. But the channel's prime time shows spent more time attacking liberals and the media. The closest analogue to Tuesday was Oct. 8. That's the day the obscene "Access Hollywood" tape came out via a story on the Post's web site. Trump prevailed in the election one month later, in spite of all the shock and sadness about his comments on the tape. Some TV commentators tried to keep that in mind while reacting, at times emotionally and personally, to the president's remarks on Tuesday. At one point, while speaking to CNN's Anderson Cooper, Van Jones said, "I don't know what to say tonight... I'm just hurt." David Gergen said on Cooper's program that people increasingly feel like Trump is "posing a danger not just to his party but to the country. He's going to tear us apart." Other political experts spoke in equally stark terms. "I would say to all Americans: we've got a problem," presidential historian Michael Beschloss said on MSNBC. "We've got a president who sent a big message today to hate groups: I'm going to make it easier for you." A tweet by presidential biographer David Maraniss went viral, perhaps because it tapped into wishful thinking by liberals. It said: "The living former presidents -- Bushes, Carter, Clinton & Obama -- should make a joint statement calling on the racist Trump to resign." The hashtag #ImpeachTrump was the #1 trending topic on Twitter for several hours on Wednesday. On Thursday, a new hashtag took over: #WhyWeMustImpeachTrumpIn7Words. Trump's unexpected Q&A was a media critique through and through. He argued with members of the press corps, assailed "dishonest" coverage, and threw in a "fake news" smear for good measure. A White House official told CNN's Jeff Zeleny that Trump had been fuming in closed-door meetings about what he saw as unfair media coverage, and it spilled out very publicly. Veteran White House reporter Mark Knoller of CBS tweeted afterward, "Have never seen as frenzied a Q&A session with a president. Or as high-decibel an exchange either." Late-night hosts ripped up their scripts. Even before those talking points came out, former Republican National Committee communications director Doug Heye, now a CNN commentator, tweeted: "I've asked the press offices at both the White House & RNC to remove me from their email lists." Conservative commentator Scott Jennings offered an impassioned plea to Trump on CNN. "Mr. President," he said, "we want to be with you in policy. But you are making it impossible for us to be with you in spirit." None of the broadcast networks televised Trump's Q&A live, because it wasn't expected to be groundbreaking. But after it happened, the broadcasters scrambled to produce special editions of their nightly newscasts. The "CBS Evening News" devoted its entire half hour to all things Trump and Charlottesville. The other newscasts squeezed in some other stories, but still focused squarely on the Q&A and the sweeping criticism that followed. "Remember," correspondent Hallie Jackson said on "NBC Nightly News," "he came down to the lobby in the first place to talk about infrastructure."